Just one word is needed to describe Ian Rush's Liverpool career: goals. The Welshman scored 346 of them in 660 appearances, a club record which will take some beating. Nothing shakes the Kop more than a goal, and no one has caused quite so much structural damage to the famous stand as Rush. More importantly, his predatory instincts were instrumental in the Reds dominating the game for most of the 1980s. He was loved at Anfield, feared at every opposition ground and renowned throughout Europe. It's hard to believe that such a glittering Liverpool career had such an inauspicious start. Signed from Chester in 1980 for £300,000 (then a British transfer record for a teenager), Rush initially felt he wasn't getting a fair crack under Bob Paisley. He even asked for a transfer. A possible move to Crystal Palace was discussed, though Paisley had no intention of sanctioning the deal. He knew that Rush's time would come. Tall, thin and ungainly, the young striker looked anything but a future striking hero when he broke into the team, but looks can be deceptive. It actually took nine games for him to register a first senior goal, but the floodgates opened from there. It was in 1981-82 that Rushie fully established himself as a Reds regular. Paisley was in the process of rebuilding his team and the new boy's tally of 30 goals in 49 appearances helped deliver an ominous message to Liverpool's rivals. Oh, and there were two new additions to the Anfield trophy room to boot. In November 1982, an awesome display of finishing by the boyhood Evertonian sunk the shell-shocked Toffees during an unforgettable afternoon at Goodison. 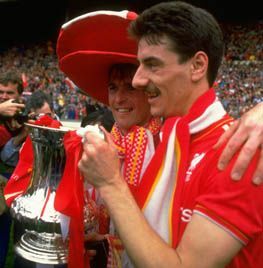 The name Ian Rush was now etched indelibly into Merseyside folklore. No wonder Europe's big fish were starting to circle. Often described by his teammates as Liverpool's first line of defence, the Wales international was not just a goalscorer but a hard-working, selfless runner who never gave up the chase. Electric pace and eagle-eyed anticipation meant he was also a nightmare to mark and his attacking partnership with Kenny Dalglish is regarded as one of the best ever. The 1983-84 season was perhaps Rush's finest. A remarkable 47-goal haul (50 if you count his spot kick conversion in Rome and two goals for Wales) was enough to see him become the first British player to win Europe's Golden Boot. This was a perfect accompaniment to an unprecedented treble of league title, European Cup and Milk Cup, not to mention double player of the year recognition. Running on to perfectly threaded throughballs was Rush's forte and when one-on-one with a keeper you'd bet your mortgage on him netting. But what made him stand out from the rest was the variation in his goals. Of course there were countless close-range tap-ins, but also in his locker were many well-timed volleys, the odd 25-yard pile-driver and occasional header. One of his finest displays of finishing came on an icy night at Villa Park in January 1984 when he bagged a memorable hat-trick. Liverpool's master marksman netted against almost every team he faced but it was neighbours Everton on whom he inflicted most damage. His memorable double against our Mersey rivals in the 1986 Cup final secured the club's first domestic double but, as the dust settled on that triumph, the blue half of the city was given reason to dance with joy when it was announced that Liverpool's lean, mean, goalscoring machine had agreed to join Juventus. Unsurprisingly, news of his move, which was to go through the following summer, shook the Kop to its core and a 'Rushie Must Stay' campaign was launched in a futile bid to keep their hero at Anfield. Determined to bow out on a high, Rush signed off by breaching the 40-goal barrier for only the second time in his career and left for the land of the lira with everyone's best wishes. After just one season in Italy, however, he was to make a sensational return. Having been made aware that their former star had failed to fully settle in Turin (it was like living in a foreign country, said Rush at the time), Liverpool jumped at the chance to sign him once more. The predator responded by picking up where he left off, scoring goals for fun and proceeding to smash any goalscoring record he hadn't yet broken. Everton remained high on his hit-list and another brace in the 1989 FA Cup final saw him finally overtake the legendary Dixie Dean as the most prolific derby goalscorer. Three years later he became the most fruitful forward in Cup final history after netting his fifth during the 2-0 victory over Sunderland. All this was small fry compared to what Rush was to achieve in October 1992, however, when he netted for a 287th time in a Liverpool jersey and in doing so surpassed Roger Hunt as the leading scorer in Anfield history. The same year saw him handed the captaincy by manager Graeme Souness and in 1995 he fulfilled a personal dream by lifting the Coca Cola Cup. Rush's work on Merseyside was still not done, though, and his last act before leaving for Leeds on a free in the summer of 1996 was to pass on his goalscoring wisdom to striking prodigy Robbie Fowler. While records are there to be broken, it's likely that the number nine's phenomenal tally of Liverpool goals will go unsurpassed well into the new millennium. Even if it is eventually beaten, the fact Rush left the Kop with 346 heart-thumping memories means he'll forever be renowned as one of the all-time Anfield greats. Chester, Juventus, Leeds, Newcastle, Sheffield United (loan), Wrexham, Sydney Olympic.